For most of you, it has been a very trying week. While the thought of a bowl game is pretty much out of the picture, the Hoos are focused on trying to salvage a season at or better than the previous season. While a 4-8 or 5-7 mark now might look pretty hard, there are a few games where Virginia has a fighting chance, and this week is one of those opportunities. Queue up Maryland for a chance to get to .500 and one last shot for a win in this rivalry game. Where to start? The Hoos and Terps have been playing each other since 1919 and Maryland holds the series advantage 32-43-2. An interesting fact in the London administration is that the away team has won the last 3 matchups. In 2010, D.J Adams scored 3 rushing touchdowns as MD won 42-23. In 2011, UVa became bowl eligible with their 31-13 victory in College Park, thanks to Perry Jones 139 yards and 2 touchdowns. Finally last season, the Terps took a 17-0 lead and held on to win 27-20 as Stefon Diggs returned the opening touchdown and Perry Hillis accounted for 2 touchdowns. The Terps have gotten off to a great start. At 4-1, they have already matched last season’s win total. They begin the 2013 season with 4 straight wins over FIU, ODU, UCONN, and West Virginia, before getting drubbed by Florida State 63-0 last week. Scenario #1: C.J. Brown, who is responsible for 13 touchdowns on the season, is the perfect dual threat QB in this spread offense and will (1) hand it off to leading rusher Brandon Ross (331 yards, 2 TD), (2) throw it to their two big play receivers Stefon Diggs (424 yards, 3 TDs) and Deon Long (348 yards, 1 yards), or (3) keep it himself, where he is the second in rushing yards with 286 and 6 touchdowns. Scenario #2: Caleb Rowe starts and will run the offense rather than be the center of it. He went 9/17 last week after the Brown injury with 119 yards passing. Maryland will run a 3-4 with a down linebacker. Watch out for leading tacklers LBs L.A. Goree (31 tackles, 3 TFL, 1 sack) and Matt Robinson (31 tackles, 3.5 TFL). Cornerback Dexter McDougle leads the team with 3 interceptions. I don’t know what to say anymore. If C.J. Brown plays, Maryland has too much offense for UVa. If Caleb Rowe starts, then they probably have enough offense to beat us. The line is UVa +7 and I don’t think that is enough. I have oversold UVa this year, but not this week. Prediction: Maryland 31, UVa 14. Now the real fun begins. We have seen the Hoos win big, come back to win, come back to go to overtime, fall short, win close, lose a game we shouldn’t, and win a game we “couldn’t”. With all of what we have endured this year, the Cavs are 1 win away from a bowl berth, and thanks to a weaker bottom of the ACC, 6-6 can put us squarely into the discussion. But first we have to get that last win, and while on paper we have a better than average shot the next 2 weeks to get that decisive win, it is not as easy as one may think. First off, this is Virginia, and this is November. The last UVa win after Halloween: Miami in 2007. The Hoos are 0-14 since then, part of the reason for the coaching change. And until the Miami game last Thursday, most Hoos would have thought the Cavs would be headed down the path to 0-18. But the outlook is a little different now that the ACC road streak has ended (item #3 in our ‘How Virginia Gets To A Bowl’ Preseason Checklist). First up this week is another road trip, this time to Maryland. I hate writing these previews, because I have actually seen multiple Maryland games, and each time, they have looked really, really bad. Hence the reason for their 2-6 start and 1-4 ACC record. The 2 Terp wins have come over Miami in the season opener by 8 when the U had a lot of their starters gone, and over FCS Towson. They have lost to West Virginia by 6 after making a late comeback, to Temple by 31, by 5 to GT, by 11 to Clemson after the Tigers made an amazing comeback, and to FSU and BC in the last two weeks by large margins, with the BC game being played in a blizzard. If Virginia is catching some breaks this year, they are being taken away from Maryland. So what are we to expect from Maryland? Let’s take a look. This is the last of the 3 new ACC coaches we will see this year. Randy Edsall has taken over for The Fridge after leading UCONN to a BCS bowl last year. He was 74-70 in 12 years at the helm, 22-26 in the Big East with 2 shared conference titles, and 3-2 in bowl games with a loss last year in the Fiesta Bowl to Oklahoma. Randy was our only non-Wahoo ‘Hoo of the Week award winner last spring when he made an appearance at the Maryland-UVa men’s basketball game at halftime, and proclaimed that “This is Maryland, we don’t lose to Virginia.” The Terps went on to get smashed in the second half and lose 74-60. An odd hiring selection as well, in what was seen as a lateral coaching move, he is trying to put a better face on this team than his predecessor, but like any first year coach, it has been hard going so far. Maryland runs a Pro Set offense and, through the first 8 games, run the ball about the same amount as they have passed (291 rush vs. 295 pass). Against Miami, it was the pass that got them out to an early lead, and against WVU and GT it was the running game that got them back in the game. 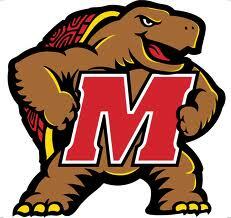 But as Virginia has now settled on a true starting QB, Maryland has opened back up the competition. The incumbent is Danny O’Brien, and while he shinned last year’s 42-23 win over the Hoos with 289 yards and 2 TDs, it has been a rough start for the sophomore. He has 1,275 yards with 6 TDs to 7 INTs and is only connecting at 57.4%. So Edsall turned to fellow sophomore C.J. Brown to lead the team, but the past two weeks have not gone his way. He has 375 yards, 4 TDs, 3 INTs, and is connecting at a much lower 47.6% rate. But to his credit is was against Clemson, FSU, and BC is a massive blizzard. Brown will probably get the nod this week, but look for a quick hook if things go south. C.J. also figures into the rushing game as he has 332 yards on the ground and 2 TDs, which gives them an extra dimension when he is in the game. Running the ball has been decent, with Davin Meggett getting the lion’s share of the work. He has 625 yards on the year and 3 TDs. Brown is second in rushing, followed by freshman Justus Pickett coming in 3rd with 236 yards and a touchdown. The passing game has been spread out as well, and the Terps get back leading receiver Kevin Dorsey after a two week absence. He has 361 yards and 2 TDs on the season. Other targets include their big TE Matt Furstenburg (298, 2TD), WR Quintin McCree (265), and WR Kerry Boykins (257). But the Terps have found 6 other players for touchdowns this year, including the Running and Full Backs, so they will try to spread it around and find those middle seams all day. The UMD offense is slightly less prolific than the Hoos and rank 85th in the country in points per game. Look for them to throw the whole playbook at the Hoos looking for cracks. It’s nice to see the 4-3 for the 3rd consecutive week, which should give us plenty to evaluate for the last 2 games of the season. But this defense has been hit by the injury bug and have had to throw in some true freshmen at key positions. Those freshman are Keith Bowers at WDE, Alex Twine at WLB, and Titus Till at FS. In addition they also have frosh in the 2 deep at DT, SLB, MLB, WLB, CB, and SS, for a total of 9. Strong Safety Eric Franklin is the leading tackler followed by DT Joe Vellano. SDE David Mackall is the leading TFL guy on the team, backup MLB Lome Goree is the leading sacker on the squad, and CB Cameron Chism has 3 pick on the year with 100 yards in returns. With a young team, especially up front, the Hoos need to, you guessed it, run right at them, all day long. But don’t count out the passing game for Virginia, as Maryland is fairly thin in the backfield and especially at linebacker, so the crossing and quick screens should be in play as well. There kickers are not overly impressive (9/14) and their punter is average (39.6). They have had 2 field goals blocked as well, and punt and kick return defense has been suspect at times as well. Look for both teams to try some sort of trickery in this game. We treat this game like we treated the Miami game: a must win. For the umpteenth week, Virginia will have to run the ball and control the line of scrimmage. It will be in the mid 50s and sunny, but the turf got tore up last week and running will be an adventure, but the Hoos have a bevy of backs and can poke plenty of holes in this young defense. Secondly, the Cavs will have to get off to a fast start. Maryland actually gets better as the game moves along. While opponents have outscored the Terps 80-37 in the 1st, Maryland has their most success in the 4th, outscoring opponents 78-58, so scoring often and early is key. Lastly, the Hoos must keep Maryland out of the red zone. This year they are 25-33 (76%) with 16 touchdowns and 9 field goals, so they are converting at a much higher percent than Virginia, and we can not trade 3 for 7 all day long. Time of Possession is a big stat against Maryland, as they are losing the margin by about 10 minutes. If the Hoos have to many short series and that average moves closer to even or in Maryland’s favor, it will be a long day for the Hoos. Stealing a page from the Miami win, Virginia can not allow them to beat us by the run and the pass. Taking away one or the other is needed, and if they can not turn Maryland into a pure passing team, they will allow to many scoring drives to overcome. In addition to keeping them out of the red zone, keeping them outside the 16 yard line is even more important. Why? The longest field goal made by Maryland has been 33 yards, and they are 0-2 from 40+. To many long pass touchdowns or long rush touchdowns could spell the end for UVa. I have been wrong the last 3 weeks so you shouldn’t listen to me. Oh, I have been right on the keys to the game, just not the outcome. Maryland opened at a 2.5 point favorite, but by Monday it moved to a 1.5 advantage for the Hoos, so you can truly consider this game a “pick’em”. And why not? What UVa team will show up? And what Maryland team will show up on Senior Day? If the game was at UVa, this would be a no brainer, but I have seen this script before. Virginia wins when they run and stop the run, but Maryland can and has made some halftime adjustments that have brought them back into games. Running teams have killed Maryland and that’s what is going to be the difference. UVa 28, Maryland 24.